Hi all, am new here, nice to find this place! Am repairing a Sega SC-3000, (blank video output, using composite from video out 5-pin DIN socket), and think I have a faulty video daughterboard. There's no significant voltage present on the supply pins of the 3 x ICs on there. From what I can tell, there's a +9V feed from main board (red wire) - then some sort of DC-DC transformer using T101 and a few inductors, transistors, and diodes. I think that's where my problem is. There's some reasonable documentation here. A lot of it pertains to the master system, but my understanding is that there's a lot of similar circuitry in the master system. It was derived from the SG1000M3. Hi Natshaw. Welcome - I received your PM. I haven't done a lot of repair work on SC-3000s but I have a pretty good understanding of the architecture. natshaw wrote: think I have a faulty video daughterboard. There's no significant voltage present on the supply pins of the 3 x ICs on there. From what I can tell, there's a +9V feed from main board (red wire) - then some sort of DC-DC transformer using T101 and a few inductors, transistors, and diodes. I think that's where my problem is. 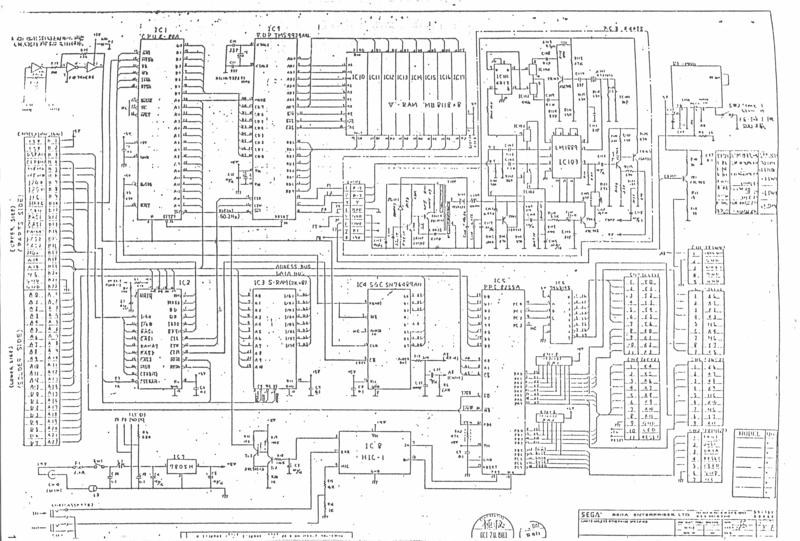 As it happens I do have a schematic including the 4905 daughterboard. Unfortunately it looks like a photocopy of a photocopy of a reduced A3 original, so it is very hard to read. But you can make a fair bit of it out if you print it on a nice, crisp laser printer. I assume you have checked the obvious stuff like the fuse. I took a quick look at one of my motherboards and it does look like there is a 9v feed straight to the daughterboard. I was surprised - I had assumed it would use the 5v feed off the 7805 voltage regulator. I don't know anything about the T101 component, sorry. That is the big round black thing at the top right of the photo. Just a couple of other questions. Also check out the translated version of Enri's home page (Japanese). That is a great technical resource with redrawn parts of the schematic. I doubt the 4905 daughterboard is on there though as I'm pretty sure that will be region specific and the Japanese SC-3000s are NTSC. Honest Bob, you are a great man - I've been hunting for a schematic for years, and then find one within 24 hours of joining this board! I'm gobsmacked, and very grateful! I owe you one! Call the favour in any time. Power light on, but does sometimes remain off for 2-3 seconds after flipping on the switch - quite odd, some weird capacitor or inductor issue, hmmm. Audio is perfect, can hear the little Safari Hunter's car chugging along, and responding to keystrokes. Yeah, I was expecting +5v from the regulator too, weird. Must be too much load. The 2 smaller chips on there can take a wide range of supply voltages, so not sure what they should actually be, might not be 5v. Anyone care to check how many volts on top-right pin of either IC101 or IC102? Can use heatsink on main board for ground. I might have to hook up an external supply after finding & disconnecting the bad bits, see if I can breathe some life into this thing. Have looked at Enri's stuff cheers, nothing there for me. Also, I think the LM1889 can do NTSC, but I admit I've never seen a schematic, so unsure if that happens on the Sega at all, or if different circuit. 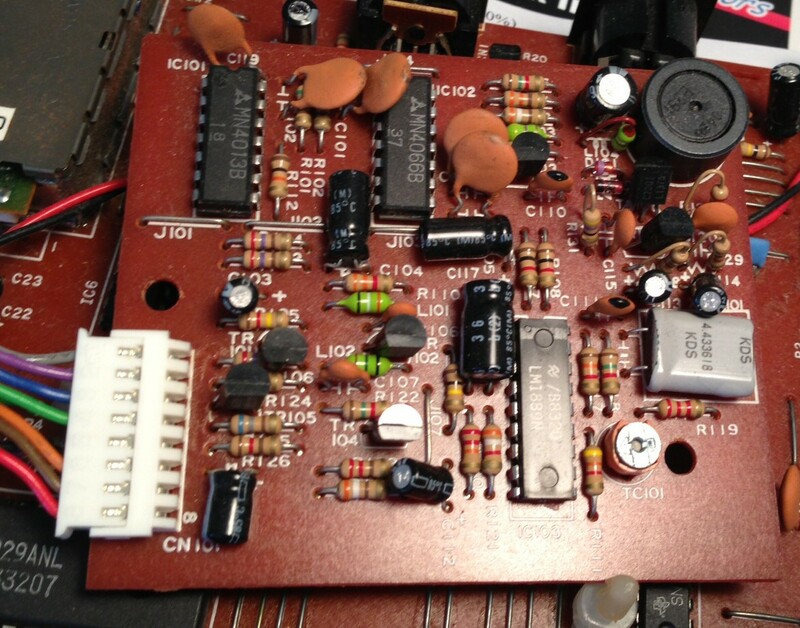 That schematic you supplied confirms what I thought - that T101 is used in some sort of DC-DC converter. I still don't understand why - it seems the sole purpose of that part of the circuit is to generate a supply voltage for the chips - why not just use a regular linear regulator? Perhaps efficiency? Isolation? I shall keep digging. My wife is really pleased at the pile of old electronics that is piling up - I need to fix something soon and reduce that pile! No worries, happy to help I always learn something new myself each time. The voltage between the top-right pin of IC101 and IC102 and the heat sink is 11.2v (although I did see one 12v reading). Good to hear the audio is working. Try a Basic IIIA or IIIB cart as well if you have that and see if that starts up, or if it fails the VRAM test (3 beeps repeated over and over for a VRAM failure - Edit: confirmed). Just regarding that Yeno daughterboard. I don't know anyone who has managed to get a good picture off one of those Yenos. My guess is that it is designed for French SECAM output which from my reading is different to just about every other SECAM standard. Note - that is just a guess. It would be great if someone could confirm my suspicions. The best I've heard reported is a greyish picture. Ah, I can do better than grey, have got ALMOST perfect picture using RGB. My Yeno only has RGB - no composite. RGB 15 kHz works perfectly on an Amiga monitor. I'm using a Phlips CM8833-II. My only problem is that the Yeno's graphics chip has a somewhat scrambled output - but you can clearly see from my linked photo that the monitor is faithfully displaying what it is sent. Note that there is no SECAM in the mix just pure RGB. Yum. The trick for me was healthy disregard for the pinouts found on the Internet. None of them actually match what is found on my Yeno. It's certainly different from the oft-quoted Sega Master System 8-pin pinouts, and is also slightly different from the alternatives pinouts I found. Now that is interesting. So can you use that to get component video out to a modern CRT or LCD TV? That would be awesome. Unfortunately although the composite output from the SC-3000s is sharp, the colors can be quite washed out and all the SC-3000s using composite I've seen suffer from colour fade. Reds will start as red (assuming you have the colour saturation high enough on your TV), but will quickly fade towards a brown colour over about 20 to 40 minutes. I don't know if that was always an issue, or if it is just due to the age of the components in the video daughterboard or the TMS9929A VDP. I'd love to develop a plug-in RGB / component video mod for the SC-3000. If you can give me a good schematic / photos of what is required I can design and manufacture a replacement plug-in PCB daughterboard for it. I've done two or three PCBs now between the multicart and the Astrododge release, so that is pretty straight forward and cheap. If nothing else, it would be great to be able to post instructions on SMS Power or similar about how to get those bloody Yenos to work as I know a lot of people have tried and failed to connect them to a TV. Just regarding the photo you posted, that looks like one or more of the VRAM chips needs replacing or cleaning OR the VDP needs removing / cleaning / resoldering. Usually that is the VRAM, although I know of one machine that had a pile of cockroach poo under the VDP which worked after it was removed, cleaned, and socketed. It is less likely to be the static ram chip as the game itself appears to work correctly. There are 8 VRAM chips on the motherboard, and each one handles a single bit in each data byte. You may be able to work out which one it is by comparing the expected and observed behaviour on screen. If you have a Basic cart, then plug that in, type ABCDEFGHIJKLMNOPQRSTUVWXYZabcdefghijklmnopqrstuvwxyz, then take a photo and post that and I may be able to tell you which chips to check. Last edited by honestbob on Fri Feb 22, 2013 10:31 am, edited 1 time in total. Interested, but not sure how hard would be. Signal is non-interlaced by default, so if you scan-doubled it, you'd get something like 480p or less? Would need to horizontal pixel double too. I think can be built by doing as above, and removing/bypassing much of what's already there. Video chip does native YPbPr - but prior to advent of modern TVs that was a useless output. Hence, Yeno daughterboards full of transistors that do the maths to get R (Pb+Y), G(Y-R-G), (Pr+Y), and Sega daughterboards with LM1889 chips to turn YPbPr into composite and prep for final RF output. I reckon we can grab that native signal, buffer/amplify it, sort out the sync/pixel doubling and feed into TV component video. Sorry. I forgot about distinction between rgb and component video - they always fit into the same category in my mind. I was hoping we could use a simple variation of the circuitry on the Yeno daughter board as a proven design to get better video output than the composite output on a modern TV. It would then have been easy for me to create a nice pcb to duplicate it. Unfortunately I think I would need around 20-30 hours of background reading to make a useful contribution to the required circuitry if we are starting from scratch, which I can't really do at the moment. There are lots of clues around the place if you hunt around for people doing component video mods for collecovisions and msx. But the common factor seems to be you have to be prepared to invest a lot of time into experimentation. That LM1889 explains the 12v feed to the daughterboard. The supply range for that is 12v to 18v. So I guess I will have to curb my enthusiasm for the moment, unless you think you have a good handle on it. This looks interesting, not sure what input resolutions/frequencies it handles. 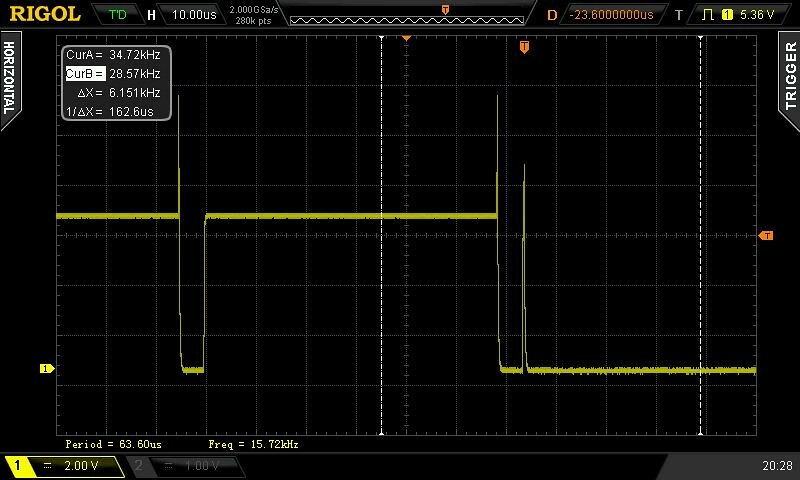 Had a good poke around the Sega Yeno's sync output with a scope tonight, confirmed is V Sync @ 50 Hz, H Sync @ 15.72 kHz (not 15.625) . That means about 314.4 lines max, bit more than half 625, I guess extra lines are dropped/ignored. Will post some screengrabs tomorrow. Nice little chip, and could be useful for Super VHS output. SOIC package is still probably large enough to solder by hand. Is it still useful for the SC-3000 if you have to convert the VDP output to RGB before connecting to the AD724? Could you plug the RGB Yeno daughterboard output (or equivalent circuit) into the AD724?